A Japanese honey bee had been kept for a certain period of time, and I wanted to have kept it also some time since then. 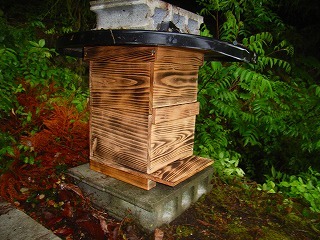 When information on the person who kept a Japanese bee on the Internet was seen, the bee's house (waiting box and capture box) was produced and set up by the easy capture. What is a Japanese honey bee? Honey in the bee that exists in Japan from of old with a Japanese bee like the West honey bee It is not bee that collects (honey) a lot. Even if honey is a little, the taste is different from West bee's thick. It seems to have dealings over the net by high price because it is the valuable one not at all obtained easily. There is neither lamplight nor collecting in natural enemy's vespid, too, because the West bee is a bee that doesn't exist originally in Japan if aimed. The person who keeps the West bee should think about vespine measures by devising it. A Japanese bee is providing with the means to oppose natural enemy's vespid compared with the West bee. It clings to the vespid in the group even if the vespid goes into the nest, and it seems to kill the vespid by the temperature because of own heat. A Japanese bee lives with worker bees in the group around the queen bee. It gives birth to the queen bee when this crowd prospers and it grows and it goes out of the nest separately for crowd two crowds it. It is the one that is called this amount of bee. At this time, an old queen takes the worker bee from the nest and it goes out. It is the one that is called, the bee's house to capture this is "waiting box". The bee's house (waiting trunk) is waited for making it to like it so that a Japanese bee may live easily. As for the installation location of the bee's house (waiting box), it is gotten and is warm in winter, and it becomes shade and cold room is chosen in summer. The material of the bee's house uses the Japan cedar material. The material that not all tree is acceptable but the smell like the pine is tight seems not to be good. However, it seems not to be a thing in the pine because it builds the nest in the room of the pine tree in the natural world. The same thing as the production article found on the net was made this time. Externals size is about 260mm in length and breadth, about 180mm in height, and the board thickness about 12mm. Externals size is scheduled to be made from about 90mm-150mm and height board thickness about 20mm-30mm as a size that the length and breadth about 300mm and cutting are good in the future because doing and the size of this size incompatible with the thing made before are odd. Board thickness uses the thing of about generally 12-30 the mm from the point of heat insulation though it seems should be thick. 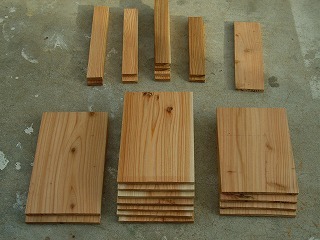 The Japan cedar material of the board thickness 12mm, 180mm in width, and 45mm was used this time. It is from on the left of this photograph in 4 2 2 2 thing of 290mm in length thing of 265mm thing of 260mm thing of 230mm board of 80mm in width to 1 piece in the board of 45mm in width as for the thing of 260mm in length. Two things of 290mm in length are prepared from the left under with the board of 180mm in width, and seven things of 260mm are prepared and four things of 235mm are prepared. I produced it with the number of sheets the same as this explanation though the number of sheets of the photograph and this explanation was a little different. Besides this, the thing of 260-360mm in length is necessary for the thing made a half in 2X4 material for length. First of all, two main portions of the bee's house are made from four things of 260mm in length and 4 things of 235mm with the board of 180mm in width. It assembles it with the course thread screw of 25mm. The hole of Φ3mm is made by the drill beforehand so that the board should not crack. Upper and lower nest frames (nest of boxes) are united by using two things of 260mm in length with the board of 45mm in width. The direction of the board adjusted the wick side to the outside. The entrance of 5-10mm in width and 7mm in height is made under nest of boxes after this. Next, the part in the bottom is made. The thing of 260mm in length is connected under this with 2X4 material by using two things made a half for length so that two things of 260mm in length may tie with the board of 180mm in width. Moreover, the nest frame put on this by using two things of 230mm in length with the board of 45mm in width is prevented from shifting. Next, the part of the lid is made. One thing of 260mm in length ties with 1 thing of 260mm in length and the board of 80mm in width by using two things of 230mm in length with the board of 45mm in width in the board of 180mm in width. It is just made to be able to do the lid, and not to shift to the nest frame (nest of boxes) sideways. Next, the part of the roof is made. To enter just like time when the nest frame was made outside of the nest frame, two things of 265mm in length and 2 things of 260mm are assembled with the board of 45mm in width. Two things of 290mm in length are installed on this with the board of 180mm in width. I will think that I need not especially make the part of this roof because I separately make the roof in the corrugated plate etc. later. Because it becomes double to prevent the heat of heat insulation and summer on, it might be good. The surface of the tree is burnt with a burner after this. I think that this is effective in erasing making externals unremarkable, and an unnecessary smell. There might be an effect to prevent corrosion, too. 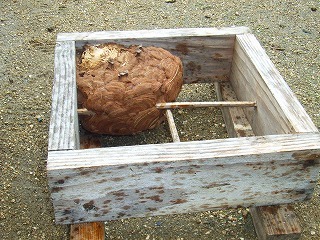 Because the bee's house (waiting box) is often made a breeding box as it is, the beehive might be prevented from dropping because of the vibration etc. by arranging bamboo [higo] in the cross in the bee's house. The bee's house (waiting box) was set up on a big rock of the hillback. Two concrete blocks were put below, and moisture from the under was prevented from coming. Rain put the iron plate on disregarding, and did the weight of the block on the bee's house. Can a Japanese bee be captured by this well?The number of bees seems to be little on a nationwide scale, and not to be the exception in my country recently either. When the bee that has come to the flower is observed, it is felt to be fewer than the ordinary year. I hear that the flower of cymbidium for Japanese bee which is a kind of the orchis was good for the capture of the bee. Only a Japanese bee is cause in this orchis flower why. I want to be going to make the flower bloom next year and to experiment. The vespid built the nest when the bee's house (waiting box) was set up, and it had left it for years how many. There is no other way in raising natural enemy's vespid though it works hard to promote a Japanese bee. Let's prevent the nest fall by arranging it in the cross with bamboo as shown in this photograph. The size of this box is about 300mm in externals length and breadth, about 90mm in height, and the board thickness about 30mm.